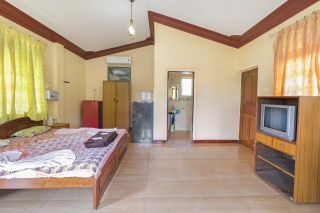 This is an offering of a single bedroom in a guest house located at a distance of 2.7 km from Calangute beach. Other beaches in close proximity include Baga and Sinquerium, which are 4 km and 5 km away from the property, respectively. Tourist attractions such as Holy Cross Chapel and St. Anthony’s Chapel are located at a walking distance. 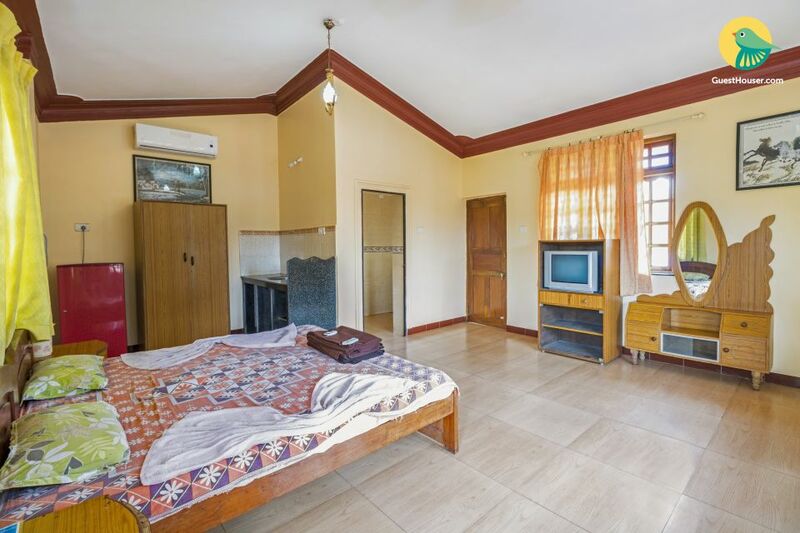 Popular clubs like LPK Waterfront is located at a distance of 4.8 km from the guest house. The property is surrounded by tall palm trees and tropical plantation. 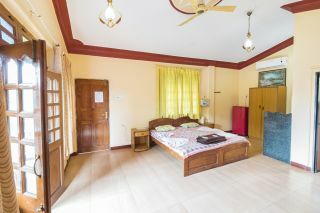 The bedroom has vitrified tiled flooring and is equipped with a comfortable double bed. Fully furnished, the room has a wardrobe, refrigerator, cabinets, a dressing table, and a split air-conditioner for convenience. 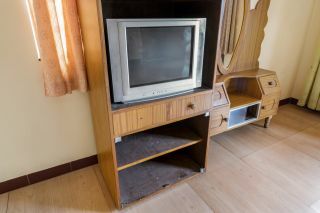 A TV is placed opposite the bed to ensure that you can watch your favourite shows in comfort. 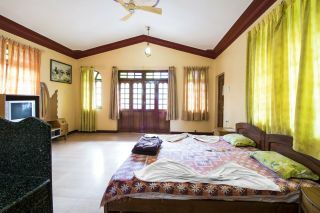 The room has ample windows which facilitate cross-ventilation and filter sufficient daylight into the space. 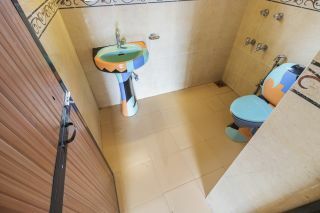 The en suite bathroom is well-fitted with western sanitary ware. 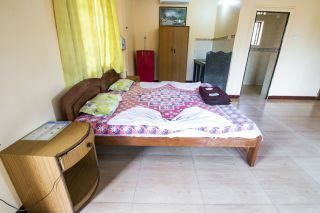 The room opens out to a balcony, which is equipped with plush cane chairs and a coffee table for additional convenience. Travel assistance is available. Car/bike rental is available. The guests are requested to provide valid identification at the time of check-in. Foreigners are NOT allowed. Famous Places: Calangute Beach - 2.2 km approx. Baga Beach - 4 km approx. St. Alex Church - 1.1 km approx. Holiday Street - 750 M. Tibetan Market - 1.7 km approx. Cansaulim Beach - 38.2 km approx. Anjuna Market - 8.1 km approx. Fort Aguada lighthouse - 7.3 km approx Corjuem Fort - 19.1 km approx.